OnePlus has been releasing quick and critical bug fix updates for the OnePlus 3’s Android 7.0 Nougat firmware making it more and more stable with each OTA. This time the company has released Open Beta 10 with many performance enhancements, stability, and general bug fixes. This is because the company wan’t to release a stable official Oxygen OS 4.0/5.0 based on Android 7.0 Nougat for both OnePlus 3T and the OnePlus 3 as well. This will take the two devices to the same firmware for the rest of their supported timeline. We first save the Nougat Beta firmware for OnePlus with the Open Beta 8 that was one of the best and even stable release for a Beat testing ROM. Now, with the OpenBeta 10 for the OP 3, comes several optimization with fingerprint unlock speed, WiFi performance, overall System performance, Battery Consumption, and much more. The complete change log is listed below. 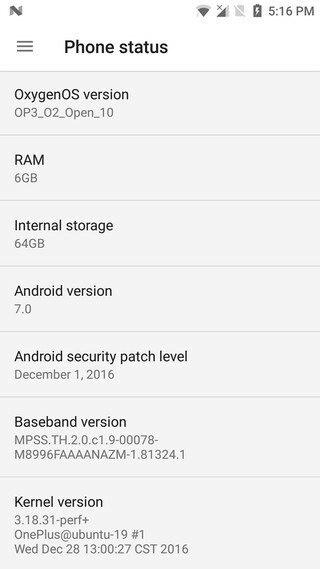 Firmware information: Device OnePlus 3, Version Open Beta 10, Update time 2016-12-28, File, size 1.51 GB, MD5 hash c9e3a9806c51b1c662624c2baed2af2a. Report issues using the built in User Feedback app or by filling this form. The Open Beta 10 is based on the Android v7.0 and not the latest Android 7.1.1 Nougat that Google phones have already received. It will take long for OnePlus to release the Android 7.1.1 Nougat or later version. Nougat Beta 10 may not work with the official TWRP recovery. You will need the modified TWRP listed below in the tutorial section. On the other hand, you can use the OTA update captured by us to update from Open Beta 9 to Open Beta 10 using the signed stock OnePlus recovery. You may also like the stable firmware for OnePlus 3 like the Oxygen OS 3.2.8 based on Android 6.0.1 Marshmallow – which is the best option if you want everything stable. However, based on our experience the Open Beta 10 is very stable and has many features. 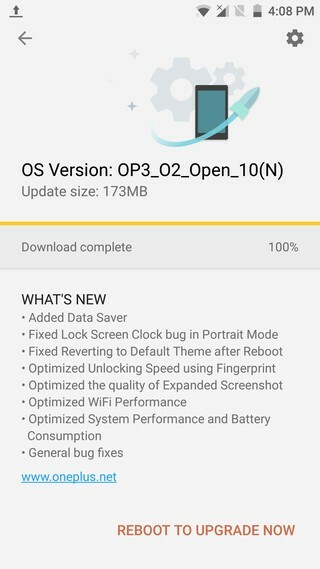 You may also like to see OnePlus 3T Oxygen OS 3.5.4 update. Here you will find the Android 7.0 Nougat full ROM or the OTA update for the OnePlus 3’s next Open Beta version 10. You may also like the official CyanogenMod 14.1 for OP 3 based on Android 7.1.1 Nougat. How to Install Open Beta 10 Nougat on OnePlus 3 via TWRP or stock recovery? There are basically 2 methods to install the ROM. Both for rooted users with TWRP installed as well as non-rooted users with stock recovery. The methods are listed below and will direct you to the exact tutorial. You can use this method if you are coming from the official Oxygen OS 3.2.8. For OOS 3.2.8, use the full ROM zip and install via ADB sideload. However, for users on Open Beta 9 and want the Open Beta 10 can simply grab the OTA and use ADB sideload or stock recovery method. For a ADB sideload or stock recovery tutorial visit – check out the instructions from here. Use the following modified custom TWRP recovery to work with Open Beta 10. Flash normally. Make sure you have the modified TWRP version. Here is a short tutorial on TWRP usage. Download the Open Beta 10 Full ROM zip from above. You can either clean flash or proceed with a dirty flash on previous Beta 9. For more instructions visit: How to flash OTA update using TWRP? If the system doesn’t boot, perform a factory reset or you can always restore back to original ROM via TWRP. How to Root OnePlus 3 on the latest Open Beta 10 Android 7.0 Nougat ROM? Simply flash the SuperSU v2.79 recommended. Flash the SuperSU package using TWRP. If you are on unmodified OnePlus 3 then you can unlock the bootloader, root and install TWRP using the tutorial on how to root OnePlus 3. You can also like a newer tutorial: how to unlock the bootloader, root, and install TWRP recovery on OnePlus 3T. Next Entry 5 ways to keep your Google Account safe – How to Secure Gmail and Google Account?